Last week I devoted a post on productive things that one can do on the weekends. (Read: What To Do On The Weekends) It was one of the most viewed post for May and I realized that far more than becoming financially independent, most of SavingsPinay Readers sees productivity as a major need too. And for this matter I will commit to one productivity each week probably Tuesday. Personally, managing time has been an everyday battle for me. I have days when I feel unmotivated. I feel so much loaded in terms of personal, work and special projects that I still have to do. No matter how others view me as the most productive person they’ve ever met, I will always fall short on what I do. I stumble and will again commit one step forward and two steps back. So if you also suffer with this same dilemma, here is a post that you can read. 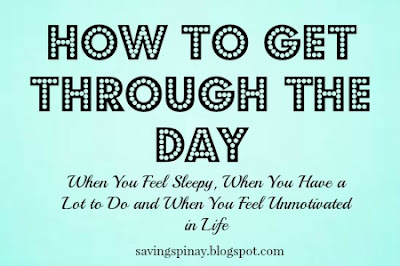 Below are the different ways that you can get through the day When You Don’t Have Any Sleep, When The Are a Lot of Things to Do at Work and When You Just Feel Unmotivated and Unenthusiastic!!! Try to uplift your spirit by eating like a King. Include a complete set of breakfast with rice and viand as well as banana or any fruit on the side. Caffeine on the other hand gives you an awake spirit and you will be surprised how a cup can make you energize to get through the day. Try anything sweets such as dark chocolate too. Remind yourself of the works that needs to get done. I know that it sounds off but if you make a “to do list” you can increase your productivity 100%. It is also a nice way to encourage yourself to create something worthy for the day and attack the must-do items that will enable you to go home early and sleep more soundly at night. Since doing my Balik Alindog program I realized how a physical activity can really increase one’s productivity. That’s why most fit person I know will always remark “na masarap magpapawis.” You will remain awake and alive to get through the day. I used to do this before at work when I don’t have enough sleep. I take a 20min nap time after eating my lunch and the moment I wake I feel so refreshed and energized. Just make sure you will only sleep for the recommend 20mins because making it too long can diminish your energy. Set an alarm, close your monitor and sleep the bad day away. Spending too much time sitting on your desk area can make you sleepy. Take breaks and stand up walk around the area so that you will have more oomph to work. Try the 50-10 method wherein you will work nonstop for 50mins and do a 10mins break. In my current work, we have 15mins break every 10am and 3pm. What I do sometimes just to let go of stress is go down and grab a snack or sometimes I just go to the restroom and really pause for a moment. Sometimes all you need is a little space and it’s getting out of the four corners of the office that could bring back that sanity in your life. I am the least organized person in the entire universe but when it comes to the office, I try to really be structured. You know where to find the files that you need. It is also easier for you to accomplish incoming tasks because you don’t consume much time in not so important matters. My life had changed completely since I learned the benefits of using a planner. You can see my last year’s planner if you visit the post What’s in My Bedside Table. I also created a focused post on what’s inside my planner before. Currently I am using a Bullet Journal as my planner and I encourage you to read Day 13 of my 14 Day Productive Challenge to know how this can increase your productivity. Plan how your month will be, schedule your meetings and reserve time for the important things that needs to be finished. Limit gossiping with your coworkers or checking your phone, or your email or your social media sites and focus on what’s important. This way you’ll finish faster and you can just relax when it is near the end of the work day. We’re only human and as a normal human being it is just usual to have days when you feel unhappy, unmotivated and unfortunate. And what’s worse is that it clearly show’s in your face. With this I came up with tips that will get you through the day that I had tried and tested. Prayer works to calm the soul. It is always a good way to just let go of your fears and your anxiety by engaging in a conversation with God. Try to be ACTS as your guide in the prayer wherein you start with adoration, followed by confession, thank-giving and salutation. Go on Pinterest and just search for a quote that can give you a boost of energy. Quotes works in a two way process. If it created a difference in your bad day then you need to share it to uplift others too. That way you will feel much more alive to get through the day with a smile. I don’t know what it is with water that gives me so much energy whenever I intake. I suggest buying a tumbler where you can put a fruit so that your water will acquire a special fruity taste. One item that I can’t leave at home is my earphone. On my way to work I listen to music, as soon as I start working on a document I will listen to a podcast and on my commute home I will again stay in tune in my playlist. Music helps to make you in the mood and let you forget temporarily the weariness. I am more of a Kpop addict at the moment so my energy playlist includes songs of Bigbang, 2NE1, EXO, SHINee and many more. It is worth noting that the sad moment will come to an end. Try to deal and embrace the sadness and promise yourself that it will the last time that you will cry or you will feel depressed. A band aid can only cover a wound but not heal it. Sometimes it is even faster to heal a wound without band aid. Hope you enjoyed today’s productivity post.